These are a few projects that I have come across. If you have anything that you would like to add to this page, please let me know. In addition to these, I have added a new page where I intend to showcase projects that I have built - be they wooden, mechanical or electronic in nature. They are located on the aptly named Stuff I Built page. 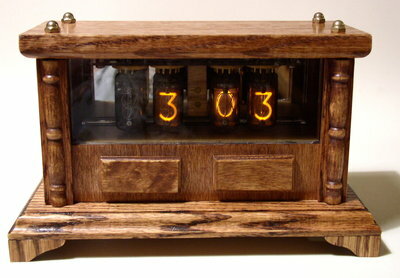 I have always wanted to build a Nixie Clock. This is my version based on my new favorite IC - the Texas Instruments' Value Line MSP430. I hope you enjoy it :) And if you build one of your own, please... email me! 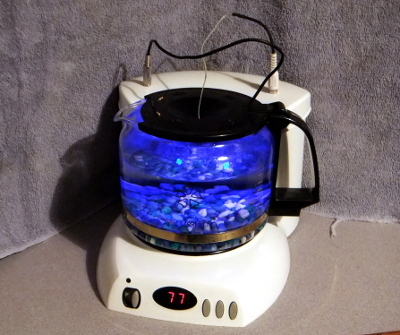 Using Texas Instruments' Value Line MSP430 microprocessor and a repurposed coffee pot, my girlfriend's Valentine's Day present, a Betta fish, is now kept at a constant tropical temperature all year round. Not to mention it just looks cool! I designed this probably ten years ago when I was running a small radio station in the neighborhood. I used a computer DJ program to serve up the MP3 files 24/7. 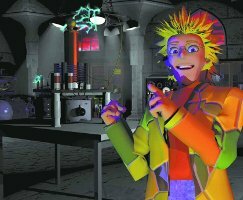 More than once, I would come into the shop in the morning, only to find the sound going "dadadadadadadada..." - stuttering because the program had locked up. 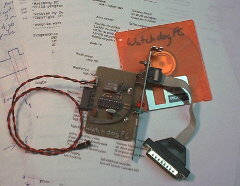 Enter the WatchDog PC. Not sure how many of you still have a ZX81 computer [as I raise my hand, grinning], but this robot that you build interfaces with that to allow you to write control programs. With very little modification, mostly software, you should be able to use any computer with a parallel port. Build your own 17 function robot that is controlled by any standard universal (or Sony brand television) infrared remote control. Three integrated circuit are needed - MAX756 voltage converter, 24LC26 serial EEPROM and a PIC16C56 for which the necessary source and HEX files are included. Emily is a super simple robot that will follow a line (masking tape works best) laid down on the floor. Dubbed the "Electro-Mechanical Inebriated Ladybug" by the article's author, Emily is sure to be a favorite of all ages. In addition to following a white line, she will also follow you if you aim a flashlight at her. Even though the article	is dated, the circuit is still very much viable (say that about a circuit with a microprocessor from 10 years ago!) and simple enough to build in one night. The mechanics might take another night. Set aside a weekend and enjoy! This project was highlighted on the Make: web site a while back. I have tried to contact the author for permission to use this with no response. I am including this here with the understanding that I will pull it if requested to do so by the author. 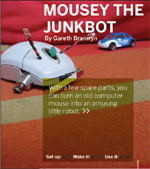 Having said that, this is a cute little robot that you can throw together in an evening with parts that any good hobbyist should have laying around :) By utilizing the components from an old mouse, with the addition of only an LM386 amplifier and a 3904 transistor, you can build a light-seeking robot of your own - saving a mouse from the landfill in the process! Pulling information from various websites and datasheets, I show you a circuit that you can build to add serial ports to your Linksys WRT54G router. The only active component is a Maxim MAX233. With a link to instructions for using the circuit. You'll want this is you plan on installing Linux on router. Perfect for controlling your next Roomba project! Using a design in the Nuts & Volts magazine, as well as information found on the internet, I built a Tesla Coil that I am currently able to pull 4 to 5 inch sparks off of and light a small flourescent tube from two feet away without wires! Learn from my mistakes and download the article to build your own. This hybrid system combines the accuracy of the digital computer with the real-time problem-solving capabilities of the analog systems together into one unit that you can build yourself. Not only will it fit right in with the rest of your Vintage Computer collection - it looks really good! First of all, this book was published in 1967. It is no longer in publication, therefore I do not think there should be a problem with hosting this material for the purpose of preservation. Having said that, this book details how to build a fully functional 'paperclip' computer using items found around most homes. I don't think you'll be surfing the web with it, but still... it's pretty cool. 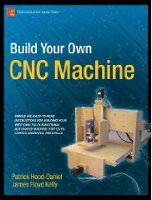 Haven't you always wanted your own CNC? Have you been drooling over demo discs and advertisements for hundred thousand dollar commercial machines for years? Then you need this book. When you click on this project, you can take a look at photos of my progress on this fantastic project. You will also be able to go to the book's web site for more information or to purchase your own copy. If you are planning on designing and/or building your own robotic friend, then you are going to be needing parts. If you're like me, then you can't always afford to obtain all of the necessary components you need to complete your project. These companies offer free samples of some or most of their products - you just have to ask!